Dairy farming in the Midwest is moving into the future as more farmers incorporate automated milking technology into their operations. The new systems are changing the way families who have farmed for generations live their daily lives. Here & Now's Jeremy Hobson talks with Kim Clark, dairy extension educator at the University of Nebraska Lincoln, about how the investments are paying off. "They actually really like it with the robots. They can go in and get milked as frequently as they feel they need to. It's consistent with the handling of the udders in the animals. People can be variable with their touch and everything on the animal. The cows can lay down and eat and drink, and that's the perfect life for them." "It is the younger farmers, younger meaning 40 and under. They want to continue on dairying within their family, and they know to make it work for their family and for their management style, robots are looking better and better every day. And probably the biggest reason we're seeing the younger producers put in the robots is they don't like to manage people, which — not that they don't like it — but it's a little more difficult for them to manage people. Their passion is really managing the cows. And so with the robotic system, you can take the employees out of the equation — not all of them, you still need a fair number — but you can spend even more time managing the cows." "Technology within agriculture is pretty significant. We don't always associate technology and agriculture together. But in addition to milking robots there is a system to push up feed to the animals. There's also automatic calf feeders. So rather than people mixing bottles a couple times a day, and going out to feed the calves, there is a robotic system where the calves can drink as much milk as they want. 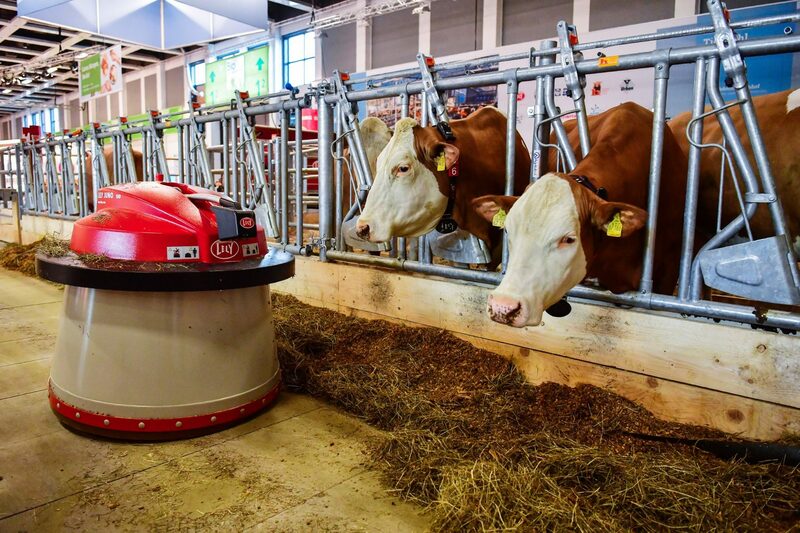 Some other technology that is starting to come about is a feed kitchen, so a robot going to each station for the feeds for the dairy animals and picking up a specific feed, putting it in a wagon, mixing it together and then going down the alleyway to feed all the cows." "With the robotic system, you can take the employees out of the equation — not all of them, you still need a fair number — but you can spend even more time managing the cows." "Not just within dairy — you can kind of find drones within all of agriculture — and they can look at the feedstuffs. So most of our dairy producers raise their own feedstuffs, especially here in the Midwest. So you can check out the feedstuff: How's the corn growing? How are the soybeans looking? Is the corn about ready to chop for silage? And then you can also check on your heifers if they're in a pasture a quarter mile away, or your dry cows that are dried off and not milking. You kinda see all of that within agriculture, whether it's in the dairy setting, the crops side or the beef side." "I think the biggest challenge is letting go of controlling, or working specifically in the parlor with the cows and adapting to that new technology. Because any time you're spending large sums of money in the millions of dollars, it's a large investment, and time and research. That's probably the biggest challenge is getting over all of the dollars that you're gonna spend to adapt and upgrade to this new technology." This segment aired on August 10, 2017.